The Accuphase brand was originally marketed under the company name of Kensonic Laboratory, Inc. in 1972. To celebrate its tenth anniversary, the company changed its name to Accuphase Laboratory, Inc. The name Accuphase was chosen as a merging of the words accurate and phase. One of the basic ideologies of the company has been quality over quantity, from the first C-200 preamplifier and P-300 amplifier to the latest products under evaluation—the C-3850 preamplifier ($43,500) and P-7300 power amplifier ($32,000). 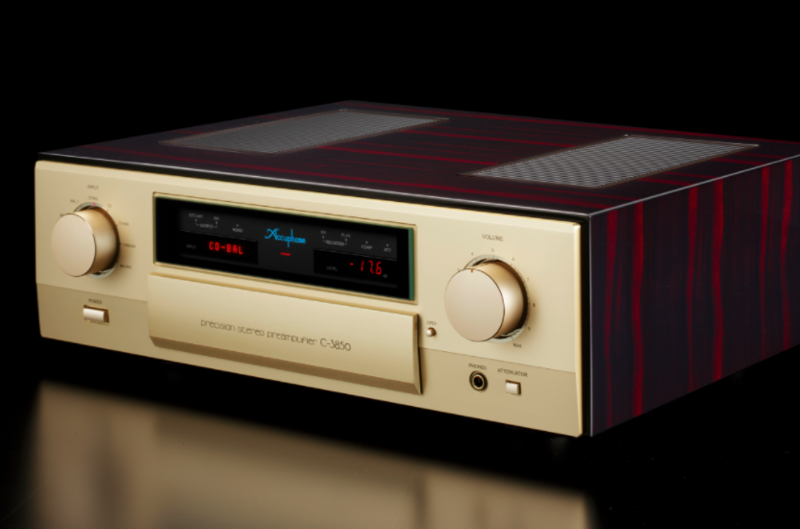 First introduced in the U.S. at CES 2015, the C-3850 preamplifier is the company’s newest flagship model, replacing the C-3800 (introduced in July of 2010). Accuphase says the C-3850 exemplifies the knowledge gained over the nearly 45 years of the company’s existence in product construction, circuit design, component selection, and technology, yielding “an audio instrument that admits no compromise in the pursuit of peerless performance.” While I can’t confirm that statement for every reader, I believe that Accuphase takes a fundamentally sound design approach with methods and practices that are on a level with today’s best manufacturing, engineering, and quality-assurance processes. One of the primary functions of a preamplifier is volume control. The C-3850 accomplishes this using what the company calls an Accuphase Analog Vari-gain Amplifier (AAVA). AAVA takes the input voltage of the music signal and converts it into weighted current using 16 types of voltage-to-current (V-I) amplifiers. Each of the 16 weighted current output stages are turned on and off by individual current switches. These V-I current stages are summed to form a variable gain circuit that adjusts the volume of the input music signal, yielding 65,536 (216) individual current levels. Before the music signal is transferred through the next stage of the preamplifier, the signal is converted back to a voltage using a current-to-voltage (I-V) amplifier. With this level (no pun intended) of refinement, the microprocessor that controls the input-signal current level is able to maintain proper channel balance throughout the operating range, to precisely set signal level, to adjust and maintain L-R balance, and to control the signal attenuator button without adding more circuitry to the signal path. Accuphase feels this AAVA approach to volume control removes the effects of impedance changes, frequency response inconsistencies, and large variances in signal-to-noise ratios when listening at low levels. The C-3850 evolves the AAVA principle by using dual AAVA (balanced AAVA) circuits in parallel to achieve the same performance when using balanced input to balanced output signals. Internally, the C-3850 is a dual-mono design with individual power supplies (including toroid transformers) with 60,000 microfarads of capacitance per channel. Each channel (left and right) has nine unit-amplifier printed-circuit board (PCB) cards per side that are made from glass-cloth fluorocarbon resin with gold-plated copper-foil surfaces. The channels are separated by 8mm of hard aluminum that is said to increase rigidity and reduce vibration. A main PCB serves as the motherboard that ties the 18 unit amplifier cards, the power supply circuit cards, the front panel PCB and display, and rear-panel input and output interfaces together. Externally, the C-3850 follows the Accuphase tradition of refined visual appeal with its golden-hue metal front panel and high-gloss natural-wood-grain cabinet—with vented grilles on top to dissipate heat generated by the internal circuitry and unit amplifier cards. Scanning the front panel from left to right one sees the input selector knob with power button directly below; the subpanel cover with the display panel above it; a subpanel access button; a headphone jack; and the volume knob with attenuator button below it.